Since finishing my last project, I’ve been itching to get onto something new. My first desire to was to build a Tempest upright from scratch or source an original machine in need of some love and restore it. Lack of available Tempest machines (for restoration) and vector monitors + game boards (for a scratch build) has put that plan on hold – for now. I did investigate Tempest VectorVGA as an alternative but the price was off putting and in the end they are not making any more. Unable to locate an existing unit for sale left that at a dead end. Another project I’ve been considering is building a Galaxian machine. The artwork is awesome and it would complement my Galaga machine nicely. I have most of the planning for this sorted and a parts list constructed. I even began investigating the construction of a lowboy as they are quite popular and I have a nice 68cm TV sitting here that would be perfect with a new chassis for arcade gaming. 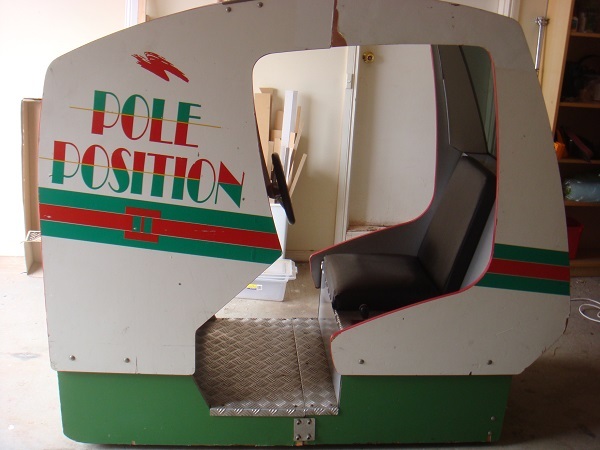 But I was then distracted by a Pole Position 2 cab a few weeks back that was for sale on the Aussie Arcade forums. This struck me as an interesting project to work on. It was mostly there – just needed some attention. I was pretty excited about the prospect of it being my next project. Sadly I just missed out on it. Amazingly, another one shows up a few weeks later, and within driving distance too!. Although lacking some things like original side part, bezel artwork and dashboard – it’s mostly there and contains a working Pole Position 2 PCB. I picked it up over the weekend brought it home.